My favorite agile tool is TDI (and please forgive an old man for having trouble shifting to 'SDI'). Not only can I whip together integration service prototypes faster than anything I can do in Java (Spring), or Python or TurboPascal, but I can also build Ops features this way. Monitoring and remote control (pause, restart, failover/failback) for enabling auto-healing, or at least making the solution cheaper to own. As you know, the cost of building a service can quickly be dwarfed by the cost of owning that service over time. This past year as a GBS consultant has made DevOps a focus of my job, and I have been applying modern tools and techniques to TDI. This includes using git for source management, which ties nicely into CI/CD pipelines. Jason of Adventures in TDI and TDI support fame helped me to install eGit in my SDI CE both on Windows and Linux. Git was created by Linux Torvald who gave us Linux, so it's really easy, fast and a de facto standard. Once this was working I focused on Dockerizing a TDI solution. This was pretty simple to do, so I first made a default TDI (SDI) image and then can roll new Dockerfiles to create images based on specific solutions (configs). Then I pushed this up to a Kubernetes cluster and tested it. Pretty simple and the answer to HA and scalability, if you're willing to design for componentization. Now my next step is to tie this altogether in a pipeline for continuous integration and delivery. Thinking of using Jenkins since I have used it before and have lots of old Jenkinsfiles to copy/paste from. Once I have everything working I though I might quick video. Writing RMI Adapter AssemblyLines can be tricky at times, especially when it comes to the Search AL - the one used for Reconcile operations. This is because the Dispatcher calls the Search AL in Cycle mode, which causes it to work differently than you might expect. The usual behavior of an AL is that an Iterator in the Feed section delivers data - one Entry at a time - into the Data Flow section where it is passed from component to component until the end of the AL is reached. At the end of each cycle, control returns to the Iterator which returns the next available Entry. If the iteration data set has been exhausted then the Iterator signals End-Of-Data and the AL terminates. When an Iterator-based AL is started then it normally runs until completion. If you launched it from another AssemblyLine then you can choose to either wait for completion, or allow it to run in the background while your calling AL continues its own processing. There is also a third option, which is to run the called AL in Cycle mode. If the AssemblyLine is invoked in Cycle mode, then it only makes a single pass each time it is called and the calling process always waits for control to be returned. On the first call, the AL and its components are initialized and then the first processing cycle is performed, resulting in a Work Entry. Each subsequent call drives the AL for another cycle, returning either another Work Entry, or null once End-Of-Data is reached. As long as the AL uses an Iterator in the Feed section then the built-in flow of the AssemblyLine will provide the caller - for example, the RMI Dispatcher - with a series of Entries as expected. However, the challenge arises when your AL must do more work to prepare each Entry. A common example is integration with a web service where a series of requests must be made to establish an authenticated session, followed by one or more requests to select relevant data - all before the first Entry can be returned. Create a new AL named 'CycleModeIteration' and then add the FormEntry Connector to the Feed section. 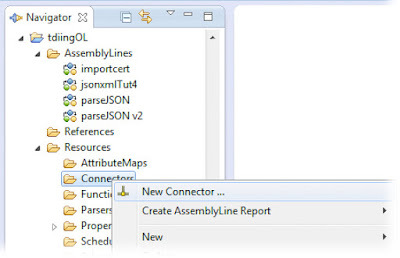 This handy component supports only Iterator mode and works just like a FileConnector, except that instead of reading and parsing data from a file, it reads and parses the data entered in the Raw Data Text parameter of its Connection tab. We won't be using this functionality, instead substituting our own via Hook scripting. 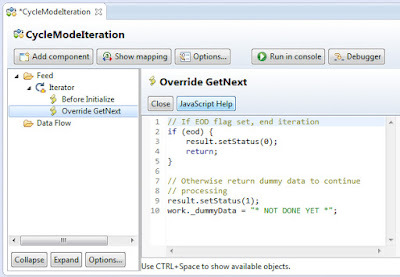 The Override GetNext Hook code will replace both the read next functionality and the Input Map of the Iterator, so our logic here has to directly add attributes to the Work Entry. Your AL should look like this. The Iterator now will continue to return a Work Entry with a single dummy attribute until the eod variable has been set to true, at which time it will stop cycling. In an actual Search AL this Branch would contain the components required to establish a connection to the external service or system. 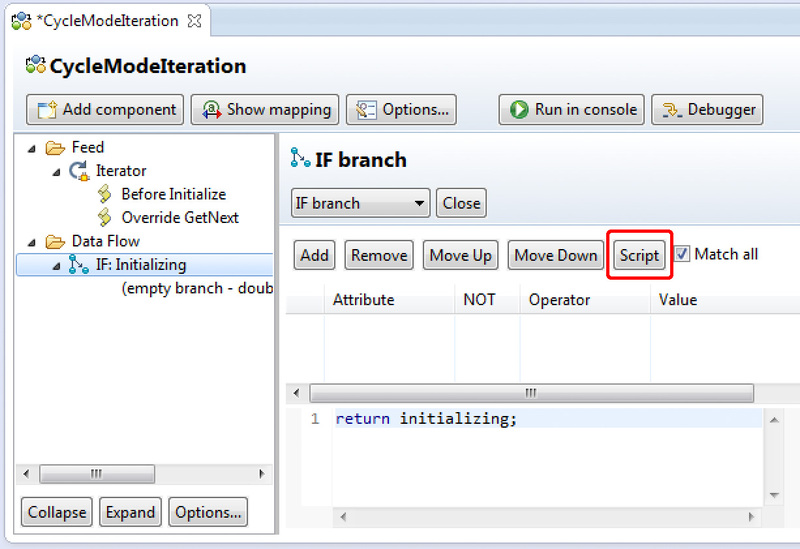 For our example you right-click the IF-Branch and add an Empty Script component that you call 'Perform initialization'. It only needs a line of script that sets the initializing flag to false. 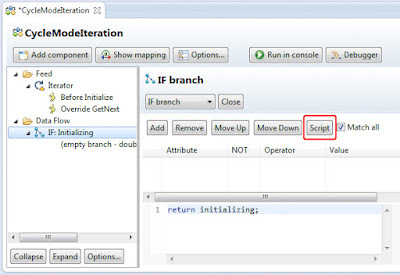 Now the IF: Initializing Branch will only be active on the first cycle. 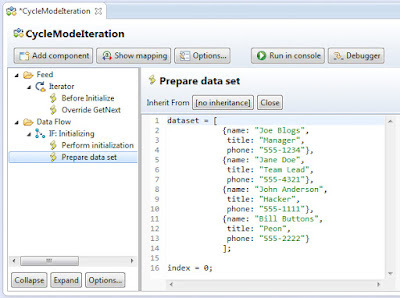 Following this Script component you add another one, this time named 'Prepare data set'. 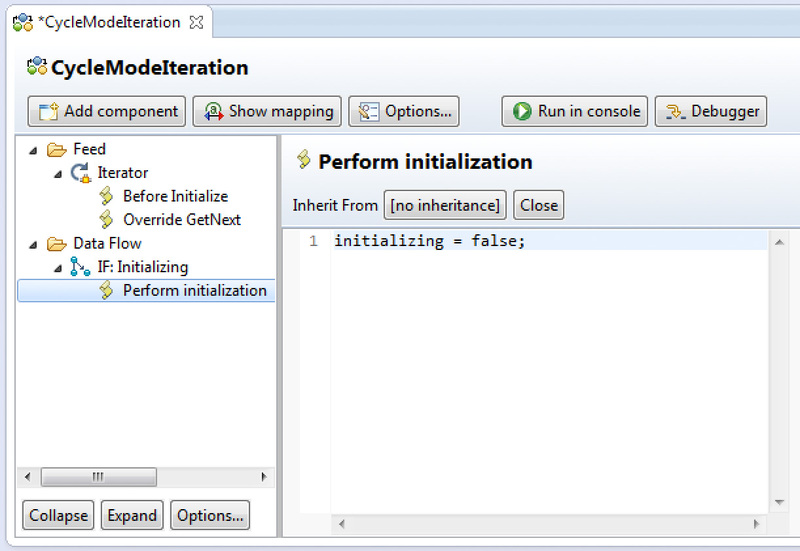 This mirrors the typical selection of entries performed by an Iterator. If a real-world Search AL is working with web service then it will request a data set and parse the return. Once again our example AL is extremely simple, using a hardcoded Array of data and an index variable initialized to 0. These Branches will control how long iteration continues for our AssemblyLine. At which point this example AL is complete. To test our new AssemblyLine we will create another AL, which we will call 'TestIteration'. 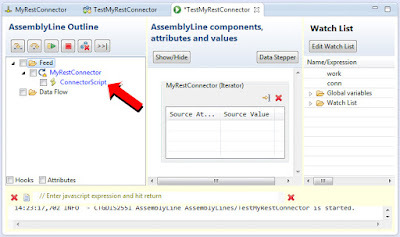 Here you add an AssemblyLine Connector in Iterator mode to the Feed section. 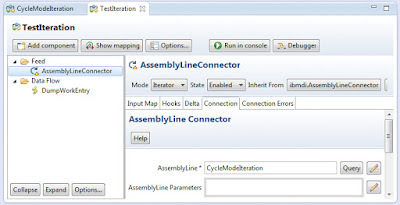 In the Connection tab of the Connector, enter the name of our example AL: 'CycleModeIteration'. 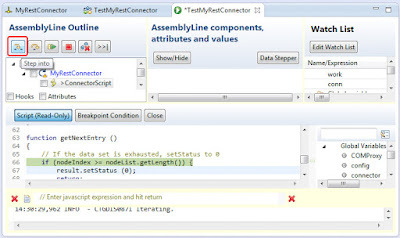 The AssemblyLine Connector will run our example AL in Cycle mode, just like the RMI Dispatcher will. Also remember to add the wildcard (*) mapping rule to the Input Map so that all data is returned. 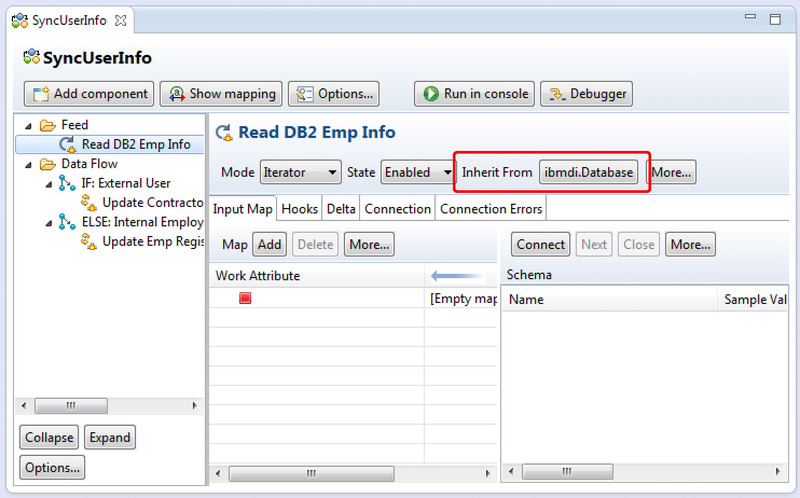 Finally, add the canned Script component named 'DumpWorkEntry' to the Data Flow section. 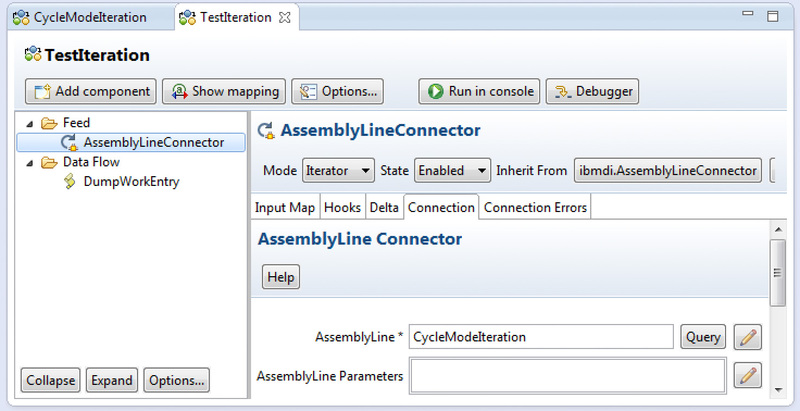 It is now time to run the test AssemblyLine and see our example CycleModeIteration AL works correctly. And if it does, then should see four (4) entries returned and displayed in the console output. The component statistics displayed at the end of the AL run show us that everything worked as expected. 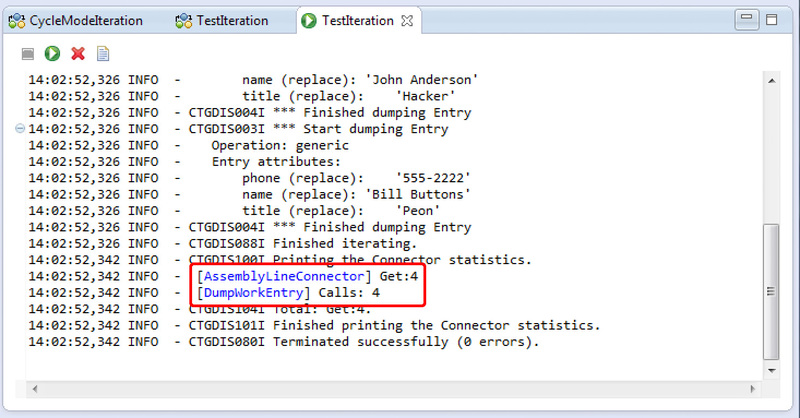 Note that if you don't get this result, then add the DumpWorkEntry directly under the IF: More data Branch (After 'Get next entry') and try running the example AL directly using the AssemblyLine Debugger. This will allow you to interactively walk component-by-component through its execution, including stepping through all script code. 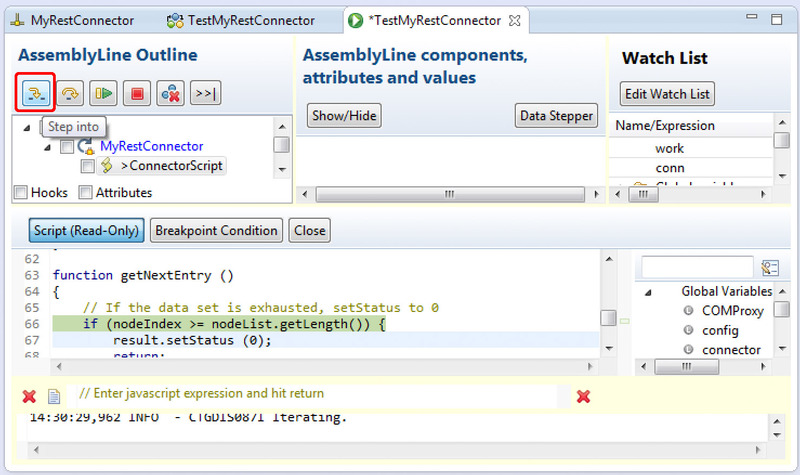 If you are not familiar with the AL Debugger, have a look at this video first. 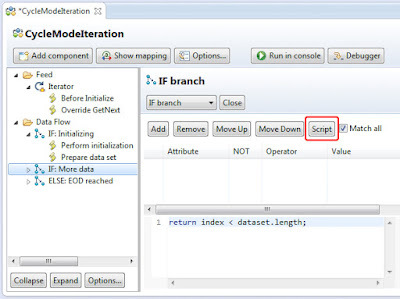 Once the example AL is running correctly then you have a template from which to build your real-world Search/Reconcile AssemblyLine, simply substituting the hard-coded data set with actual information received from a connected service or system. 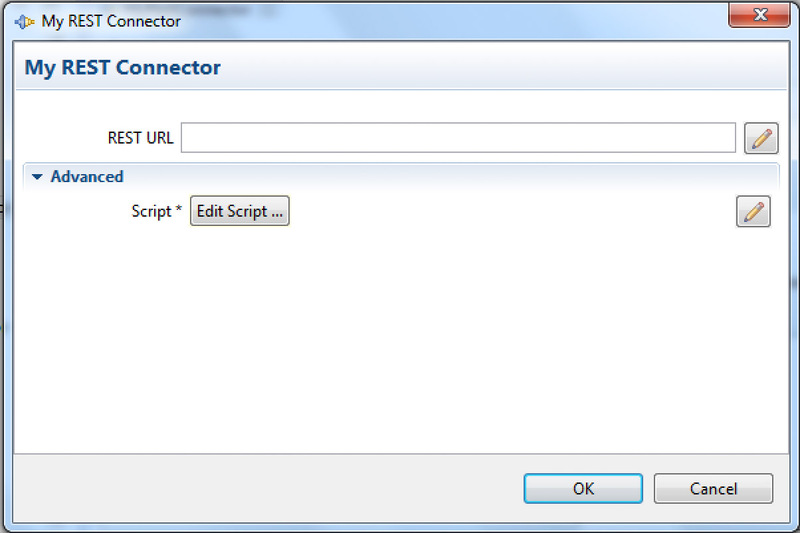 As promised, this post will walk you through creating a custom Connection Tab Form for the Connector scripted in the previous post. Myself being in true form, I will begin with a promised explanation and then a bit of theory. There are a couple of routes to this knowledge. For one, you can ask the TDI Server for a report on installed components via the object menu (right-click) on your running Server. 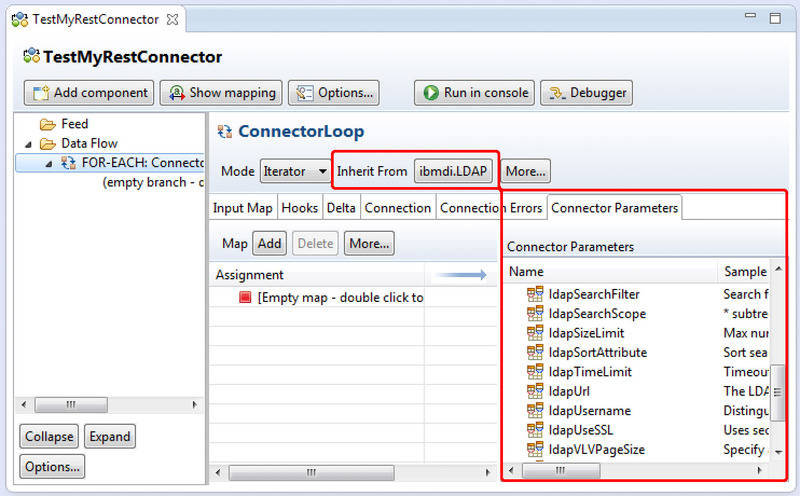 Another approach is to select this component in the Inherit from setting of an AL Connector, Function or Connector Loop. Note that if you select a Library component found under the Resources of your project, then the internal name is not displayed. You must choose a basic component in order to get the internal name shown. Just as with components, every parameter in TDI (SDI) has an internal name which can be used to retrieve or set this value programmatically. To discover the internal name of a parameter, either click on the label for that paramter, or on the pencil button to the right of it. // refers to the AL Connector owning the Hook. // selected for it via the Inherit From selector. // Furthermore, all AL components are also script variables. // you can still access it by requesting a reference from the AL (i.e. task object). 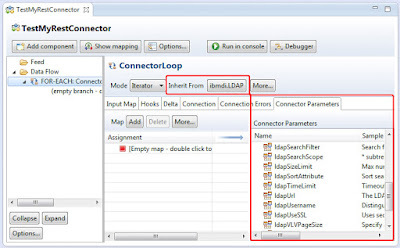 Another way to see the internal names of all the Parameters of a Connector is to attach it to a Connector Loop and then look at the Parameter Map tab. 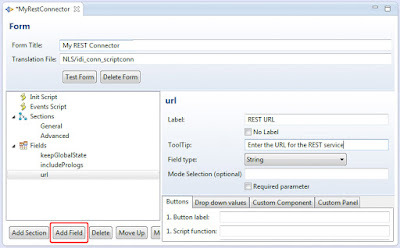 Returning to the topic for this post, we will now change the Connector scripted in the previous post so that the url used to make our REST request is entered as a parameter in the Connection tab of the Connector instead of being hardcoded. The first thing we'll do is to close the editor for this Connector first. It is important that we do not open multiple editors for the same item, otherwise changes may be overwritten or lost. Once no editor is open for our Connector then we use the right-click option Open With... to edit it in the Forms Editor. The first time you edit a component with the Forms Editor you are asked if you want to use the default form as a template. 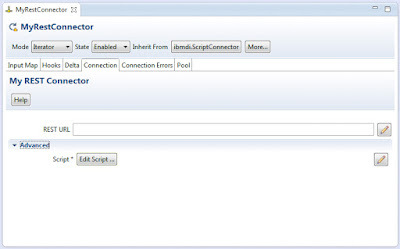 If you answer Yes for our example then you will get the default form for a Script Connector. Otherwise, the Forms Editor will start with an empty Form. For this example we'll answer Yes. 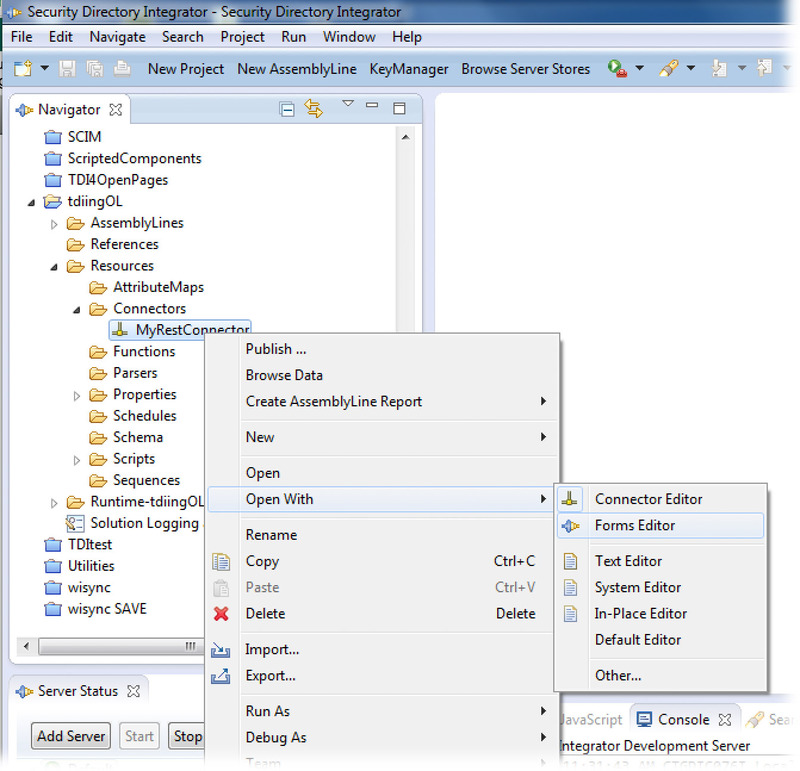 The top pane where the name of the component and NLS resources (if any) are located. The navigator for the Form at the left. The details pane for any item selected in the navigator area. In the top pane (1), the Form Title is entered. This value will be displayed at the top of the Connection tab. Unless you understand how translation resources are managed, leave the Translation File parameter unchanged or even empty. There are also two buttons located in this area: Test Form to launch the Form in a dialog for testing and for setting default values for parameters, and Delete Form. Immediately under these two script items are the Sections of the Form. Most standard components include a General and an Advanced section in the Connection tab. However, you can define as many sections as you need. Each section has a name (which is optional), the flag for whether this section is already expanded when the Connection tab is selected, and finally the list of Fields that are visible for this section. This list of Fields is ordered from top-down in the same way as they will appear in the Connection tab. Below Sections is the list of Fields defined for the Form. Each field is identified by its internal name. The details pane (3) provides the editor for whatever item is currently selected in the navigator. If the item selected is one of the two script options, then the details area will provide a script editor. 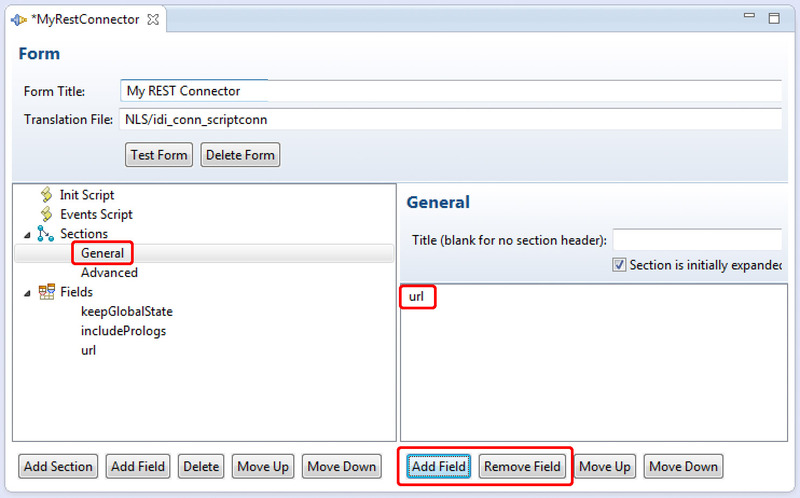 If a Section or Field is selected then its editor appears in the details area. For our example, we will start by creating the 'url' Field for our new Form by pressing the Add Field button at the bottom of the navigator pane and naming this Field 'url'. In the Field Editor that appears to the right we can enter the Label for the field. This value appears onscreen to the left of the parameter setting in the Connection tab. We can also specify a ToolTip to be displayed on mouse hover-over. The Field type is chosen, which is String in this case. The Mode Selection option can be used to only display a field for certain modes by specifying these in a comma-separated list. We will leave this setting blank. 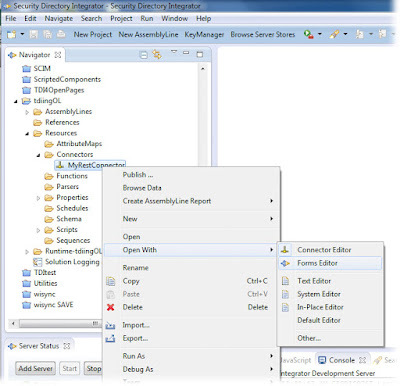 At the bottom of the editor are a series of tabs where one or more Buttons to follow the parameter can be defined, drop-down values specified for Fields of a drop-down type, and where custom components and panel logic can be loaded. If you want a bit more detail on most options available in the Forms editor, consult the TDI/SDI User Guide. We'll proceed now based on the description provided above. For example, this page for TDI 7.1.1 describes Forms Editor features, and is unchanged since TDI 7.1, as well as for later versions like SDI 7.2. Now we select the General Section in the navigator and remove the $GLOBAL.script Field already visible here using the Remove Field button. 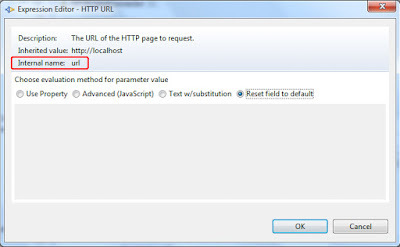 Then we add our new 'url' parameter by pressing the Add Field button at the bottom of the editor pane. Now select the Advanced Section and remove the Fields already there. Finally, we add the $GLOBAL.script Field to this section. Note that the $GLOBAL. * fields are predefined and provided access to standard features like file browsing and, in this case, script editing. 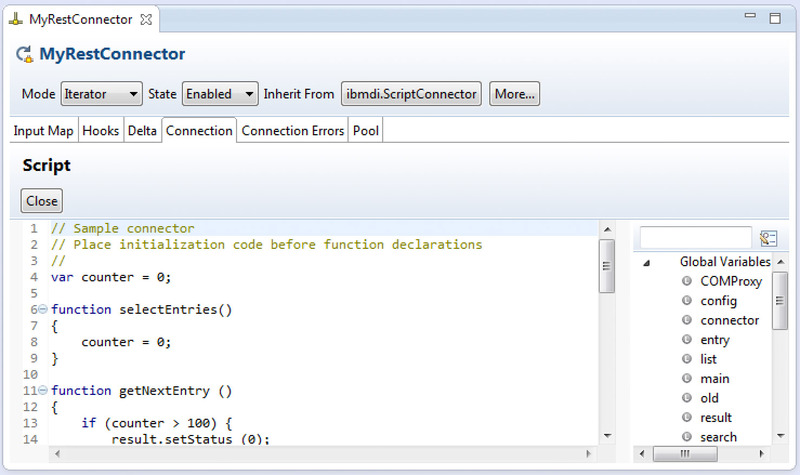 Please note also that the $GLOBAL.debug Field represents the standard Detailed log checkbox found in most components. 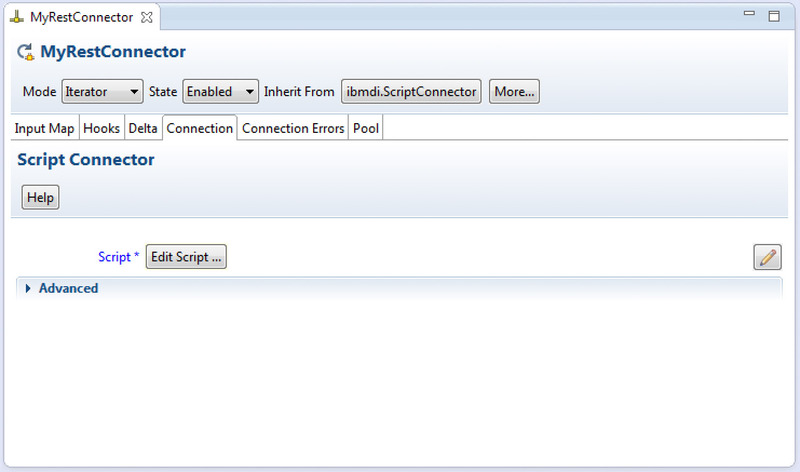 However, if you enable this for a Script component, then the entire script is written to the log. 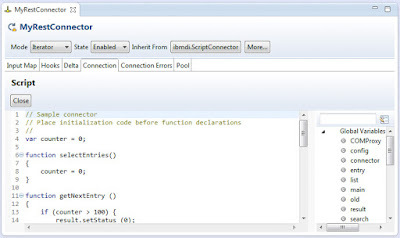 As a result, you will want to implement your own 'debug logging' Field if this functionality is desired. Now if you press the Test Form button you should get a dialog with the Form you just defined. Any values you enter for parameters here will become the default values for this component once you close and save the Form. 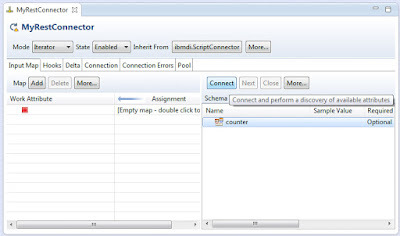 Now close and save the Forms Editor and use Open With... to open the Connector with the Connector Editor again. Now when you select the Connection tab then you will see your newly created Form. 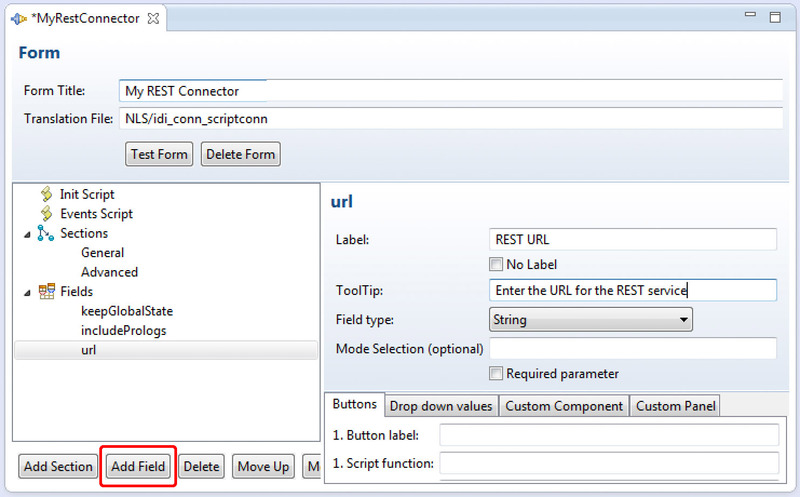 Our last step will be to edit the Connector script in order to have the 'url' variable set to the value entered for our REST URL parameter (internal name: url). We access the script using the Edit Script... button that we added to the Advanced section of the Form. We now need to decide how our component will behave regarding dynamic changes made to our parameter setting. 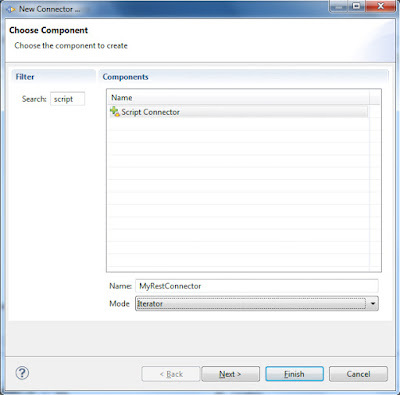 When the values entered in the Connection form of a component are actually used to refresh the settings of a Connector or Function differs from component to component, and in many cases, from parameter to parameter in a component. 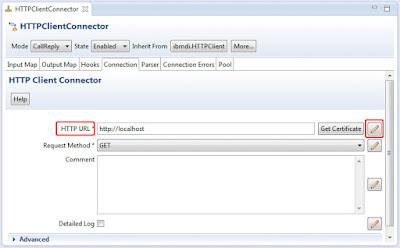 For example, the LDAP URL Parameter of the LDAP Connector is only refreshed when that component is initialized. However, the Search Filter parameter (internal name: ldapSearchFilter) is also refreshed before selectEntries() is performed for Iterator mode. 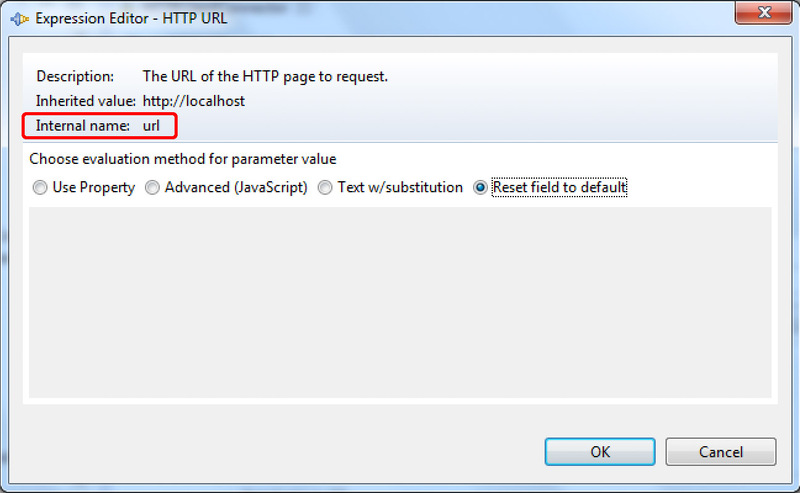 In our example here we will refresh the 'url' variable in the initialize() function only. 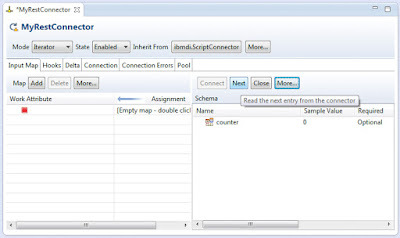 The predefined 'connector' variable provides access to our Connector Interface where all parameter values entered in the Form are kept. 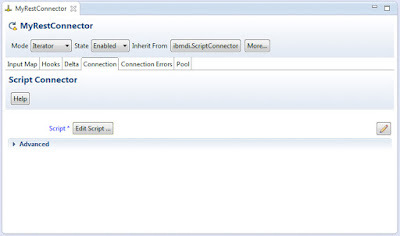 Once we have made these changes to the script then our Connector is configurable via its Connection tab. Now we have a few options for sharing our new component. 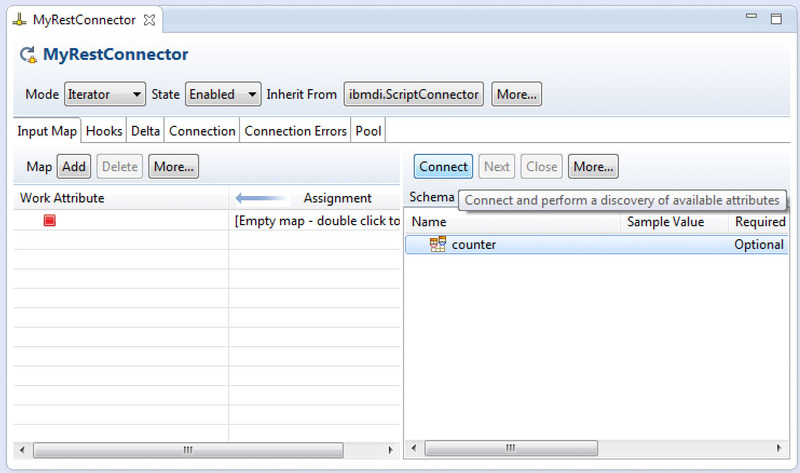 Of course, the .connector file itself can be shared and dragged-dropped into new Projects. You can also use copy-paste directly in the CE to do this. If we want to use our new REST Connector in multiple ALs in the same Project, we do so easily as long as our Connector is stored under Resources > Connectors. 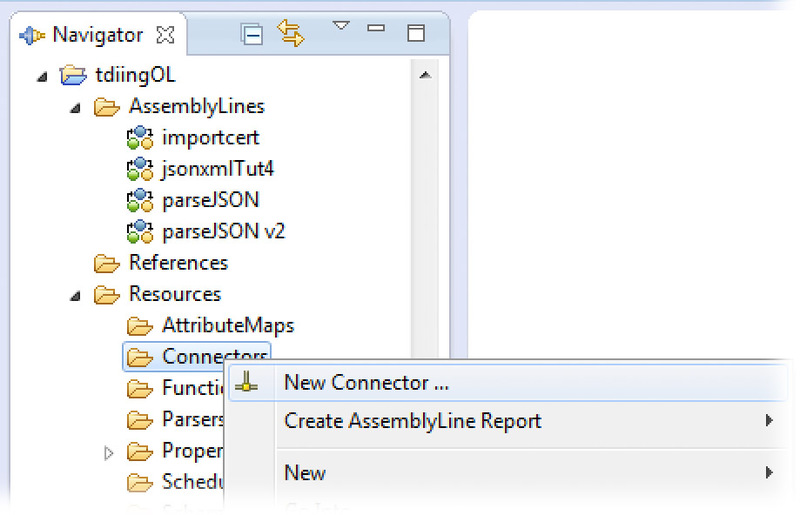 If we want to leverage the component in another Project, then one way would be to define a Reference in this Project to the Config xml where the Connector is defined. Then it will be available for use in this other Project. Another route would be to right-click on our Connector and choose the Publish... option. 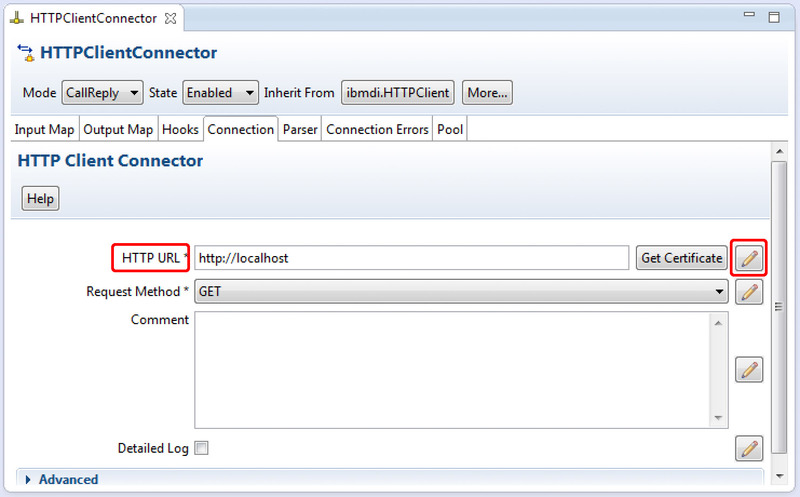 This allows us to export a 'package' to the packages folder of the installation directory. 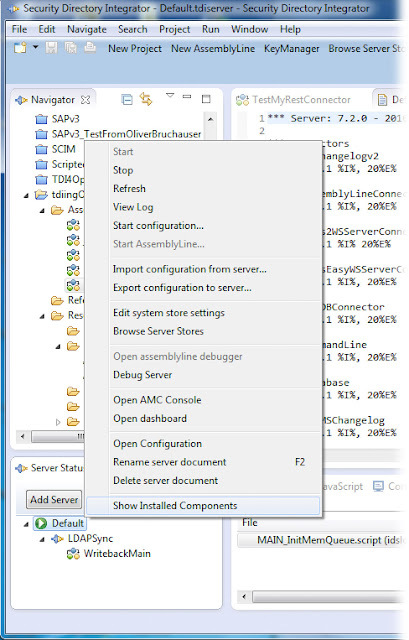 Components found in packages are available for use by any TDI Server started from this installation directory. And until I get feedback warranting an update (as you may have seen me do for other posts) that'll be all for now. Continuing from my last rambling post, we'll script an Iterator Connector that will return the same parsed entries as our Conditional Loop did. I'll begin with a little theory, which you will find duplicated other places like the How-To page of www.tdi-users.org and this venerable video tutorial on the subject. 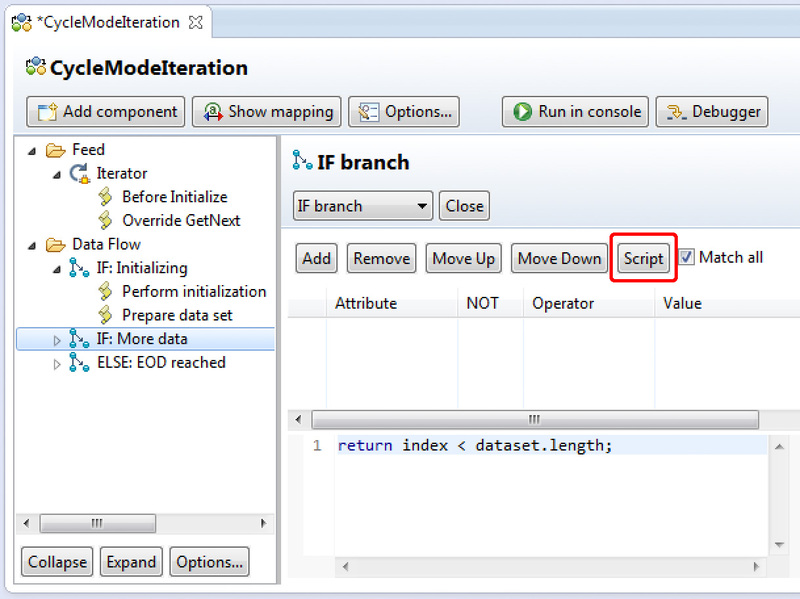 To script a component in TDI (SDI) you start with the basic Script version of that component. So in order to script a Connector, you add a Script Connector. Typing 'script' in the Search box filter the selection list. Since we'll be implementing only Iterator mode, we may as well choose this mode in the wizard. Our new Connector looks pretty much like any other Connector at this point. 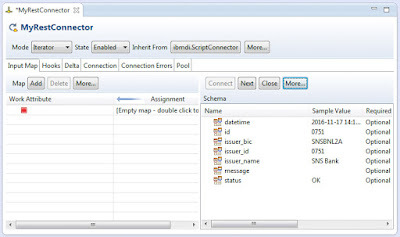 All the features provided by the TDI AL framework are visible in the various tabs: Input/Output Map, Hooks, Delta, Connection Errors and Pool. 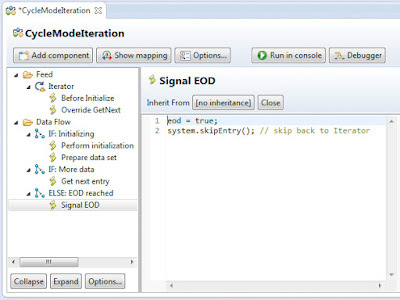 You can also choose the Mode and State for your Connector, as well as when the component will initialize. Only the Connection tab is specific to the technology our Connector is interfacing with. That is why this aspect is called the Connector Interface, or CI for short. 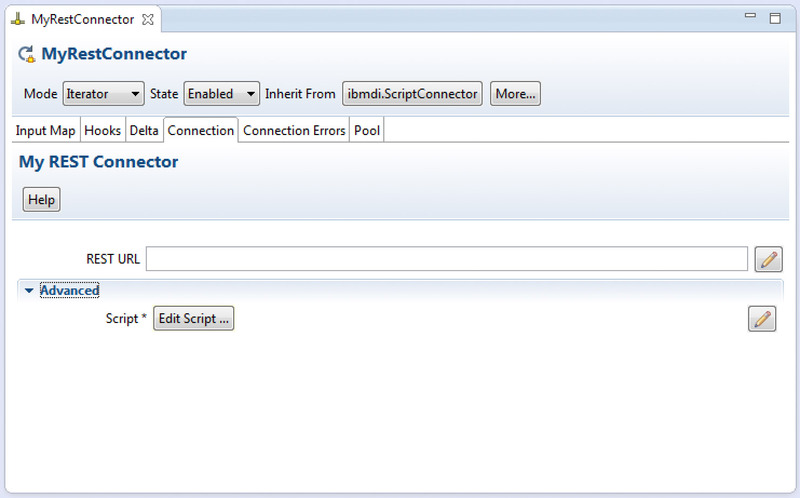 The Connection tab of our Script Connector does not hold the usual set of parameter (yet), but instead gives us access to the interface logic of the component via the Edit Script... button. Press this button to open the script editor. Once in the editor, we can see that our new Connector has a preloaded example script. At the top are the two functions necessary for Iterator mode: selectEntries() and getNextEntry(). 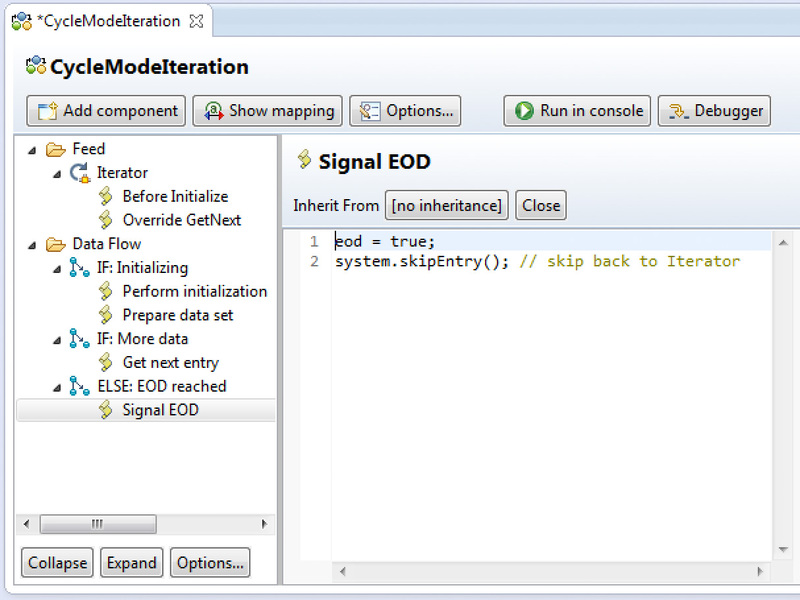 This is how a scripted component works: if the required functions are present in the script, then that operation or mode is available. Note however that for a scripted Connector, the Mode drop-down will always contain all modes - including those not supported by its script. 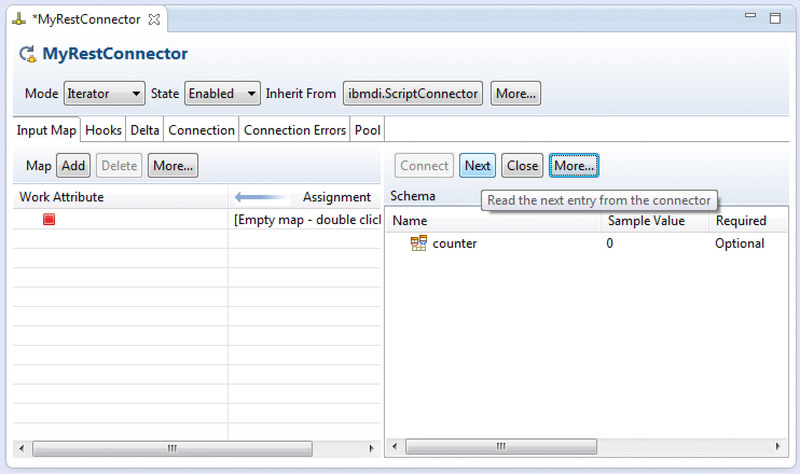 A scripted Iterator is easy to test in the Schema section of the Connector's Input or Output Map. Pressing the Connect button calls the initialize() function (if one exists), followed by querySchema()and then selectEntries(). 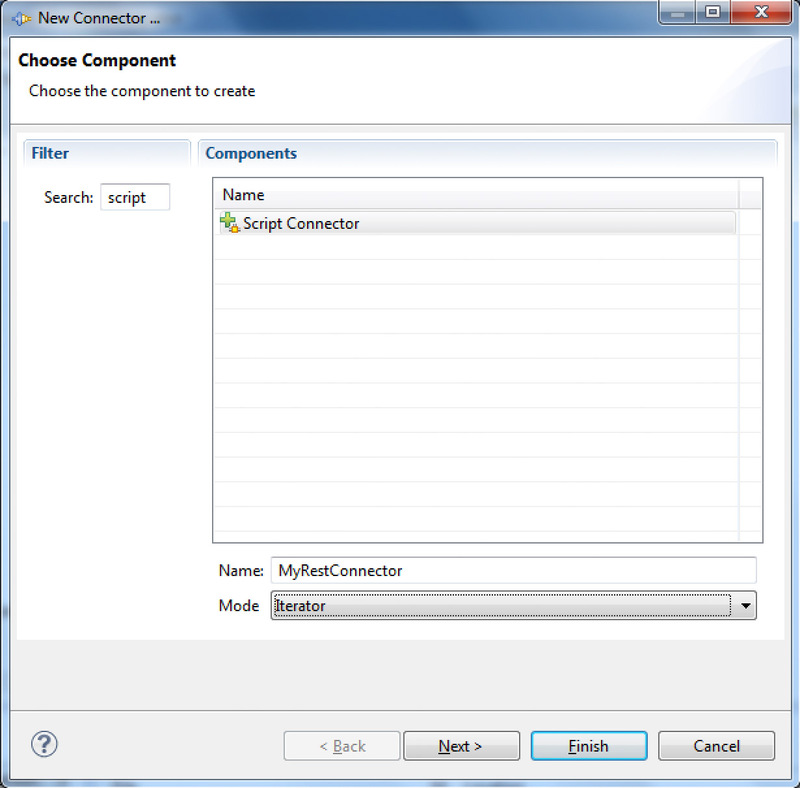 Once connection and selection are complete then the Connect button is grayed and the Next button becomes available. Each time you press this button it results in a call to getNextEntry() and either returns data or signals EOD. And now for something cool: Simply open the script editor again and change the If-statement in getNextEntry() to signal EOD after 10 entries instead of 100. 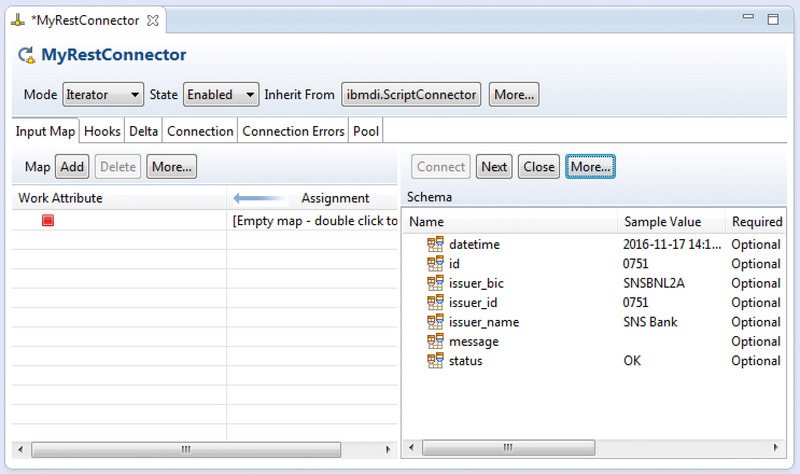 Then return to the Input Map tab, press the Close button in the Schema area and then Connect again. 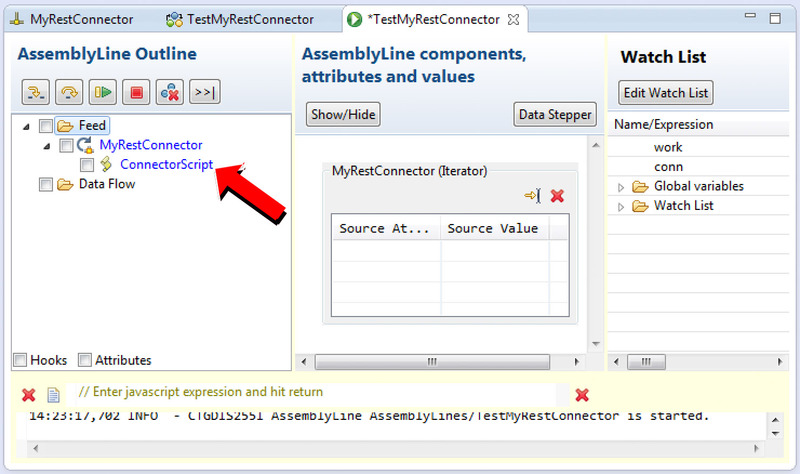 This causes the script to be reprocessed and lets you test any changes you made to the code immediately. // are global for the entire script. // and I'll get back to this in a later post. 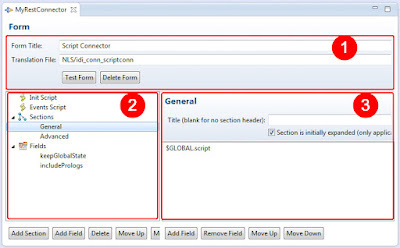 We can test the validity of this script by bringing up the Input Map tab again and pressing Connect. 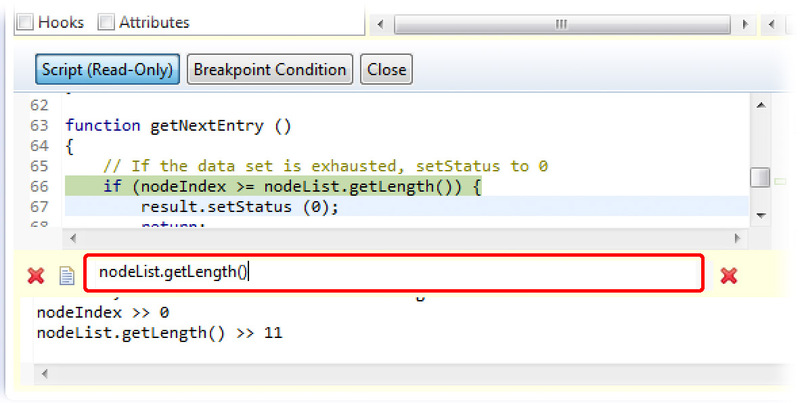 If you did not empty out the selectEntries() function then you'll get an error when you try this. Once this is in place then we can start testing it using the Close, Connect and Next buttons. And violá! we have a fully functional Iterator. We can use it in the Feed section of an AL or in a Connector Loop, we can code any of the Iterator mode Hooks, and we can enable Delta if we want to detect changes between each call to the service. 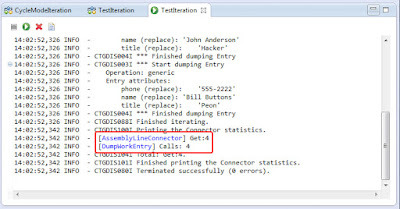 And what's more, if we drop our Connector into an AL then we can step through the script in the AL Debugger. 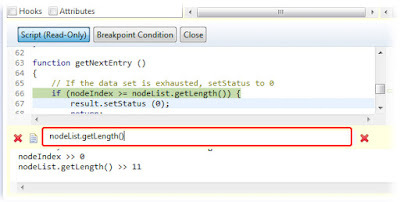 At this point, we can either double click on ConnectorScript and then set breakpoints in the code, or just start stepping into using the Step into button. Note that pressing Step into while in the script takes debug processing into for- and while-loops, as well as if-statements and try-catch blocks. Step over will do just that: stepping over these code blocks. Each time you press the ENTER key then the script snippet is passed to the running server and run in the context of where the AL processing is at that point. This lets you inspect the state of your component by logging the results of all statements executed, as shown in the screenshot above. 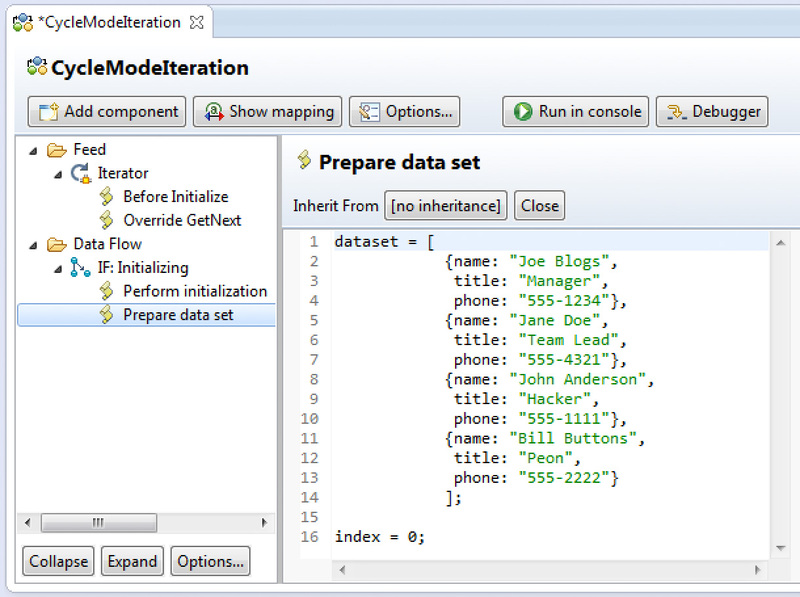 Furthermore, you can modify the values of variables and attributes, as well as the contents of Entry objects. You can also define new variables and instantiate new objects, calling scripted functions and invoking Java methods as desired. I'll keep my love ballad to the AL Debugger short and conclude with the recommendation that you learn to love this time-saving tool. And I'll wrap up another extended blog here. 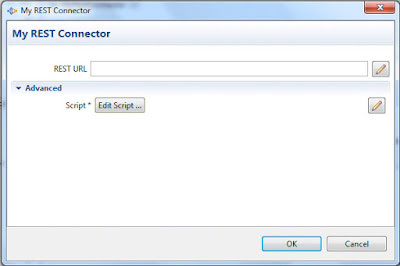 But I will return to show you how to set up the custom Connection tab for your scripted Connector, so stay tuned!